Soil application of the systemic insecticide imidacloprid (Admire®, Bayer Crop Science) produced season-long control of citrus canker caused by Xanthomonas citri sbsp. citri. Imidacloprid is a neo-nicotinoid that breaks down in planta into 6-chloronicotinic acid, a compound closely related to the systemic acquired resistance (SAR) inducer isonicotinic acid. Potted Swingle citrumelo seedlings (Citrus paradisi × Poncirus trifoliata) were treated with imidacloprid and the SAR inducers, isonicotinic acid, and acibenzolar-s-methyl as soil drenches or with acibenzolar-s-methyl as a foliar spray 1week prior to inoculation of immature leaves with X. citri sbsp. citri. Seedlings were re-inoculated four times over a 24-week period. SAR induction was confirmed by expression of the PR-2 gene (β-1,3 glucanase). Soil drenches of imidacloprid, isonicotinic acid, and acibenzolar-s-methyl induced a high and persistent up-regulation of PR-2 gene expression and reduced the number of canker lesions for up to 24 weeks compared to 4 weeks for foliar acibenzolar-s-methyl. Soil applied inducers of SAR reduced canker lesions up to 70% compared with the untreated inoculated plants. 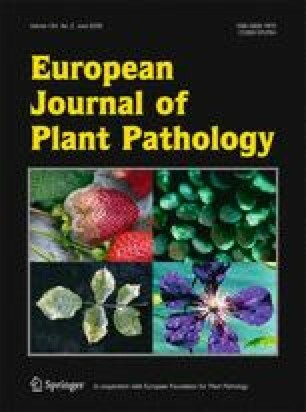 Lesions on leaves were small, necrotic, and flat compared to pustular lesions on inoculated untreated plants. Populations of X. citri sbsp. citri per leaf were reduced 1–3 log units in soil-treated plants compared to inoculated untreated plants. We thank to Alma Briseno, Maria Peacock and Diane Bright, (University of Florida, CREC) for their technical assistance, and Edwin Civerolo (USDA-ARS, Parlier, CA) and Zhonglin Mou (University of Florida, Gainesville) for suggestions in the revision of the manuscript.